On Saturday 13th of April to celebrate the 15 year anniversary of Wing Tsun Kung Fu in Blanchardstown, we will have a seminar on the day for three hours. Some of the guest instructors that we have had in the past will be there and together we will have a multi disciplinary seminar in aid of charity. Sifu Michael O'Leary, Si-Hing Micheal Preston & Si-Hing Joe Kennedy will teach some Wing Tsun. Guru Brian Kennedy will teach some Kali. 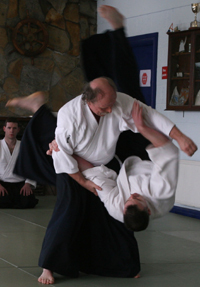 Sensei Eamon Coyne will travel from Sligo and teach some Aikido. Last but definitely not least, Coach Ken Byrne will teach some Gracie Jiu-Jitsu. There is no charge for the seminar but as it is a charity seminar we would invite attendees to make a donation. Everyone is welcome. Current students, anyone who has trained with us in WIng Tsun Blanchardstown in the past or anyone who would like to spend a really good three hours training quality martial arts. 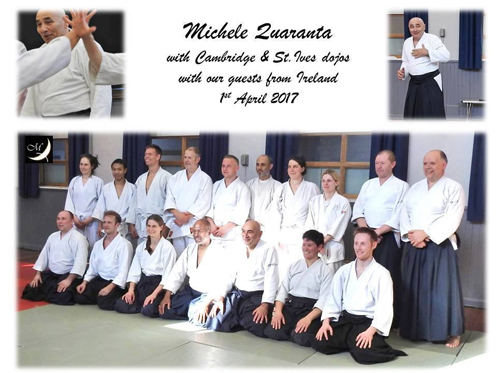 Yet another great course with Michele Quaranta Shihan in Wicklow on 23rd and 24th of March. A lot covered and repeated in this Spring training as Michele Sensei articulated. At the course Athboy student Bert Gore graded successfully for 2nd Kyu: 二級 under the examination of the Technical Committee. Not easy considering Bert was the only candidate. Well done Bert. 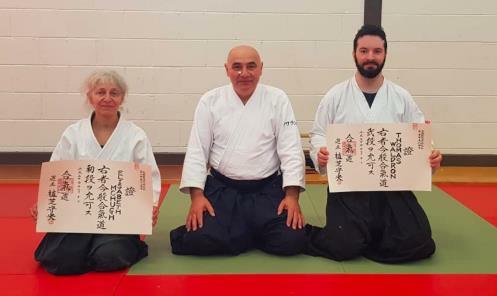 Also at the course Michele Quaranta presented Thomas Waldron (Sligo Aikido Dojo) with his Nidan certificate and Lizzy McHugh (Ikeda Dojo Wicklow) with her Shodan certificate, well done to both on your achievements. Thanks to all that attended the course, and a special thanks to our international friends for travelling to train with us Valarie McGettigan (Vermont, USA) and Britta, Adriana and Francis (Cambridge, UK) a pleasure to have you with us. On Saturday 27th of April there will be a Technical Committee Seminar and kyu exams, details to be confirmed location etc. 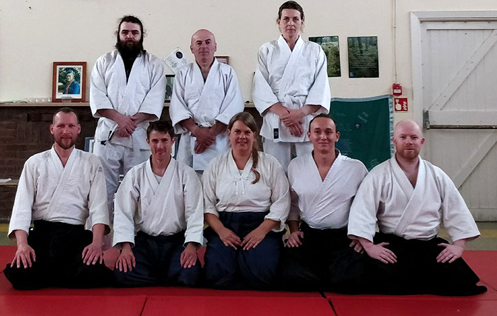 A great class yesterday in Sligo Aikido Dojo courtesy of Trevor Pigott Sensei 5th Dan of Athboy Aikido Dojo. Trevor shared some really nice techniques and variations for the Sligo crew to drill. Thanks for a great class Trevor. 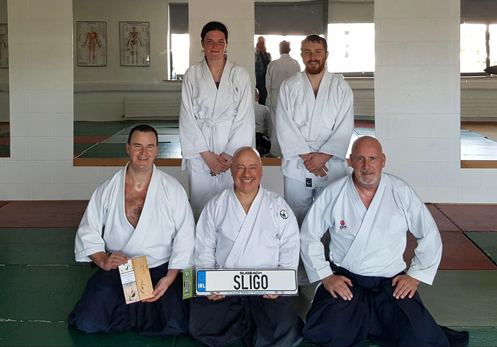 Straight after we had the Kyu Gradings, whereby the following Sligo Aikido Dojo students successfully passed their examinations. Congratulations to all, you done yourselves proud. Keep up the great work. Thanks to the Ukes for their great help on the day. 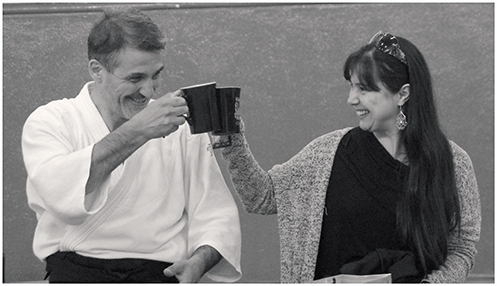 A massive congratulations on 7th Dan promotion to Aikikai Ireland Technical Adviser Michele Quaranta Shihan so thoroughly well deserved. 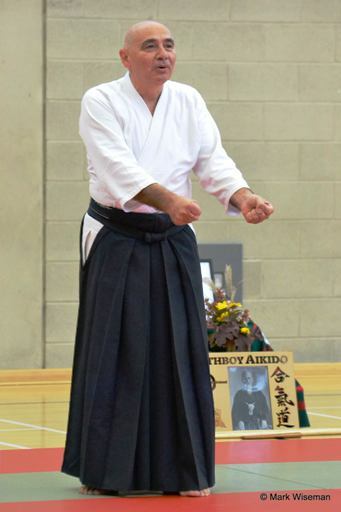 All at Aikikai Ireland our proud of your achievement Sensei. Congrats to all our Aikido friends in Ireland and around the globe on promotions too. 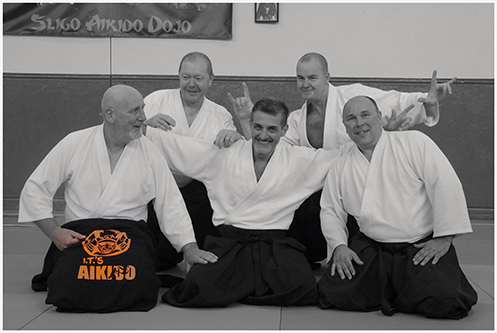 On the 2nd of June 2009 Aikikai Ireland was officially formed by a core group of Aikido friends. Over the passed 10 years we have had some wonderful times both on and off the mats both here in Ireland and abroad, making life long friends along the way. To mark the 10th anniversary we will have a residential camp in Drewstown House, Athboy. The course will run from Friday 31st of May until Monday 3rd of June. 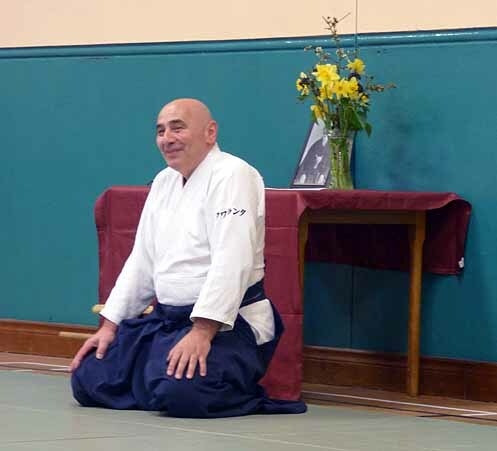 We are delighted to announce that an Aikido Friendship Exchange seminar between Shobu Aikido Vermont, USA and Sligo Aikido Dojo, Ireland will take place on the 29th and 30th of June 2019. 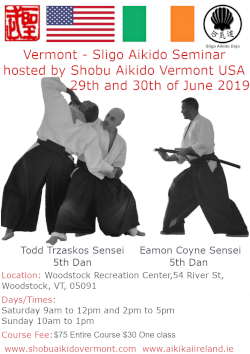 Todd Trzaskos Sensei 5th Dan and head instructor at the Shobu Aikido Dojo (https://shobuaikidovermont.com) and Eamon Coyne Sensei 5th Dan , Sligo Aikido Dojo will be the instructors at this seminar. 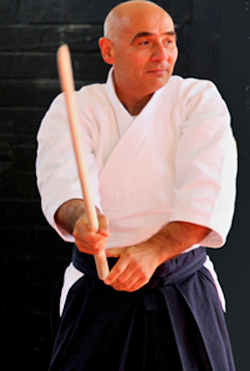 Todd Sensei began his Aikido training in 1992 and has over 40 years of martial training experience. A huge thanks to our friend Valarie McGettigan for making the connection to allow the colloboration to happen. Exciting times ahead. 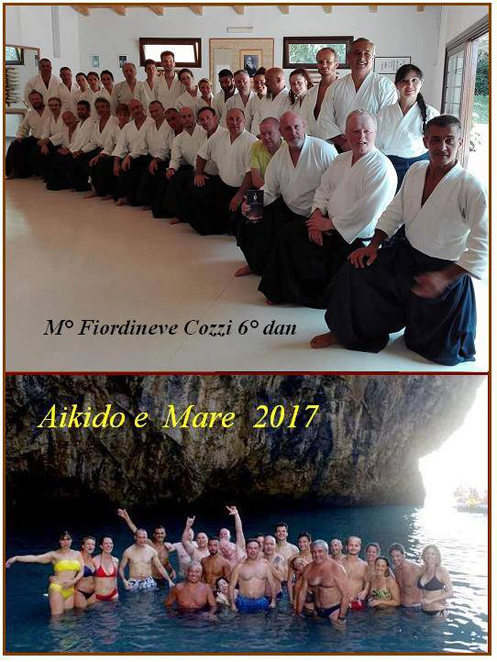 We look forward as always to these seminars with Michele Sensei and hosting our Aikido friends from near and far. 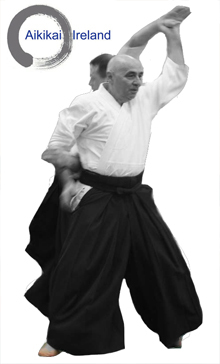 The summer camp will also be a celebratory course in that it will be the 10th anniversary of Aikikai Ireland. We look forward to seeing you on the mats. 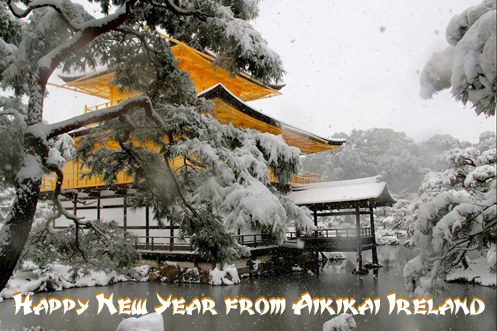 Merry Christmas and a Happy New Year from all at Aikikai Ireland!!! 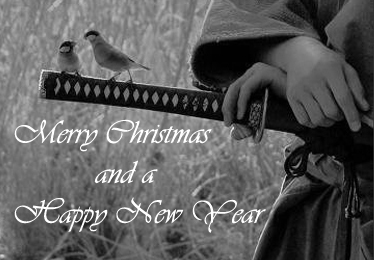 Wishing everyone in Aikikai Ireland, all our Aikido friends and all of the Aikikai Ireland website visitors a Happy Christmas and Peaceful and Prosperous New Year. 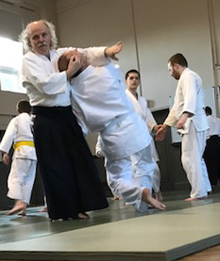 The Aikikai Ireland calendar for 2019 is looking good with plenty of Aikido action. Look foward to seeing you all in the New Year folks and thanks to all involved who made 2018 such a memorable one for all at Aikikai Ireland!!! A great days training and nights celebrations at the Aikikai Ireland Technical Committee seminar hosted by Sligo Aikido Dojo. 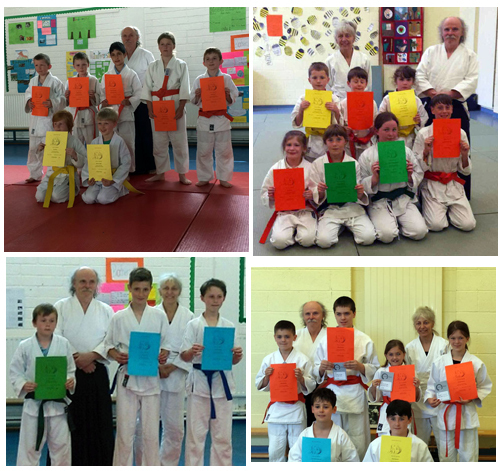 A sincere thanks to Eamon Coyne Sensei, Joe Mchugh Sensei and Trevor Pigott Sensei for the classes. Thanks to all of the people from the dojos around the country that came to train with us and all of the Sligo students too. Thanks to Anthony Brennan for the pics. 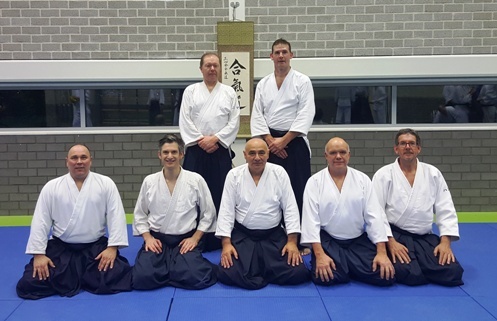 A trip was made by anAikikai Ireland group consisting of Trevor Pigott, Tony McHugh, Barry Tully and Will Baker to the 10 Year Anniversary seminar of Sanshinkai Aikido Utrecht which was given by Michele Quaranta 6th Dan Shihan and host Sander van Geloven 4th Dan held on 26th to 28th of October. The lads enjoyed their time both on and off the mats, being well looked after by host Sander, having nice tranining, food, and a trip around Utrecht on a boat. 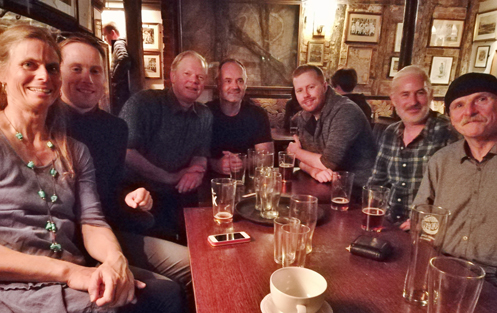 Thanks from the lads Sander and your group in Utrecht for a great weekend. 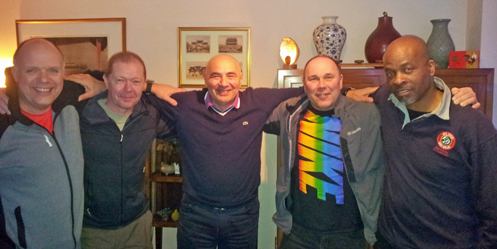 Also at the course was our Swiss friend Andreas (Andy) Hänggi also in pic. Thanks to all that attended the course and a special mention to Valarie McGettigan travelling from Boston and Francis Rowland and Adriana González travelling from Cambridge to attend the course to train with us, great to see you. 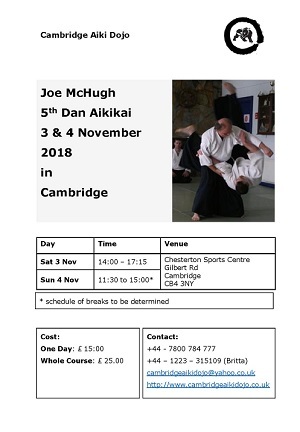 On Saturday 3rd and Sunday 4th of November Joe McHugh Sensei will give a seminar in Cambridge Dojo. Promises to a thoroughly enjoyable course as always..
Well done to Aikikai Ireland instructors Eamon Coyne of Sligo Aikido Dojo and Joe McHugh of Ikeda Dojo Wicklow whom were both asked by Gary Quinn author of the newly published book "Martial Arts and Self-Defence for Everyone: A Complete Beginner's Guide", if they would help with the narration of the chapter on Aikido and also if images of both Sensei could be used in the book. 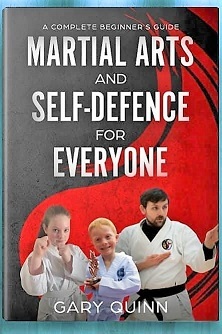 If you feel anyone wants to get an insight and overview of Martial Arts/Self Defence in general it's a great book to do it. The paper back version is due for release in the coming days. 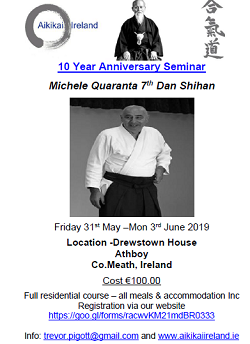 Another year and another wonderful summer camp with Michele Quaranta Shihan in Donegal. At the course there were also Dan examinations, a huge congratulations to the following successful candidates. Have the latest information about seminars in your pocket. Sync up the calendar to your smartphone! Subscribe to your calendar on smartphone (Android) or by adding the calendar to a Google Account. To synchronize with your Android smartphone, you need to do both steps below. Step no. 1) Add Calendar to a Google Account. Step no. 2) Turn on sync on your Android smartphone. 1. Add a calendar to your Google Account. Click on the icon at the bottom right corner on Google Calendar located on these pages above. At the request, sign in to your Google Account via your name and password. When Google Calendar "Seminare SAA" has been added to your Google Account then all changes to the seminar schedules are automatically synchronized. 2. Turn sync ON/ OFF for individual calendars on your Android smartphone. Before you start to sync a calendar with your Android device, you need to add a calendar to your Google Account as above. If you have multiple calendars, you can decide for each of them to sync ON/ OFF with your device. If you have a calendar that appears in your Google Calendar account but not in a mobile app on your Android device, turn ON sync for this calendar. Select one of your calendar. Note: It may take some time for the events to appear. You all done great and special thanks also to the Ukes that helped on the day. A great weekends training with Michele Quaranta Sensei and Greg O'Connor Sensei in Wicklow on the 24th and 25th of March. Both instructors gave very enjoyable classes for all in attendance. Thanks to all of the people that travelled from near and far and also to the Ikeda Dojo Wicklow gang for hosting the course. Also at the course Michele Shihan presented the 5th Dan diplomas from Hombu Dojo to Eamon Coyne and Trevor Pigott, both Eamon and Trevor were very proud and honoured to receive this award from their Sensei Michele. 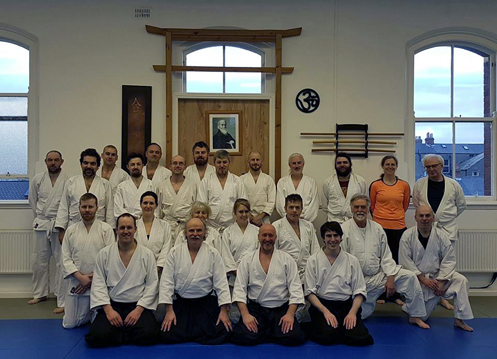 Recently Sligo Aikido Dojo had an impromptu visit at class from Nathan left front row of picture. Nathan is from the Dojo Vézelois in Eastern France (http://www.aikido-tadashi-do.fr/). 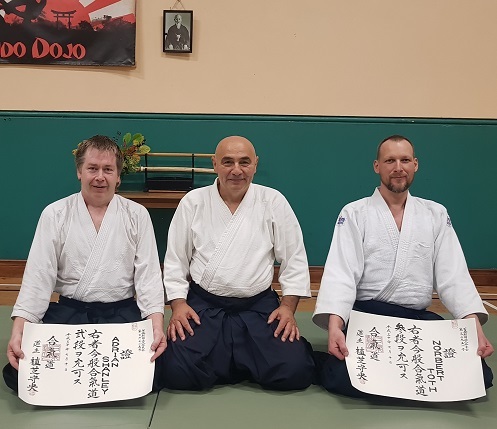 Nahan brought great energy to the mats and was a pleasure to have him train in Sligo Aikido Dojo, a follow up exchange could happen in the future, watch this space ;-). 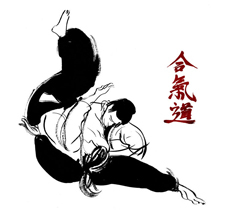 Sligo Aikido Dojo will be running a beginners class program starting on Saturday 10th of February at 10.30am. 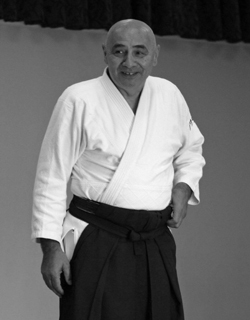 Classes will be given by Eamon Coyne Sensei 5th Dan Aikikai. The cost of the classes are €5 per class. 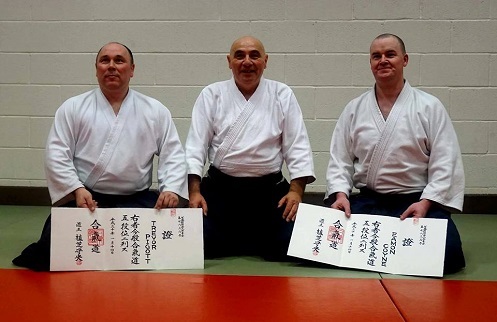 A massive congratulations on 5th Dan promotion to both Eamon Coyne Sensei of Sligo Aikido Dojo and Trevor Pigott Sensei of Athboy Aikido Club. Well deserved. Congrats to all our Aikido friends around the globe on promotions too. 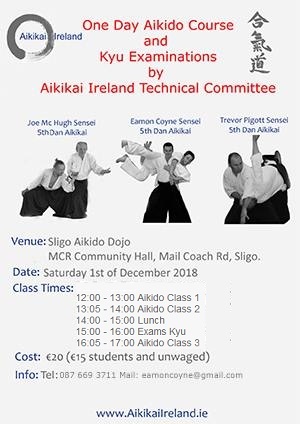 On Saturday 1st of December 2018 Sligo Aikido Dojo will host a seminar which will be given by Aikikai Ireland Techncial Committee members Joe McHugh 5th Dan, Eamon Coyne 5th Dan and Trevor Pigott 5th Dan. 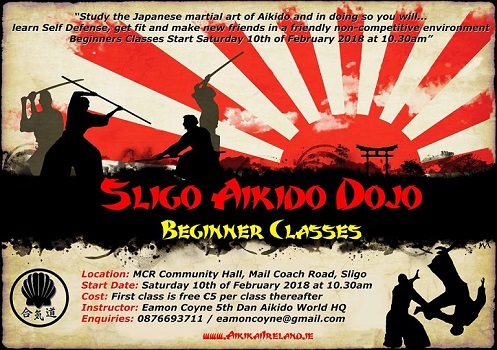 Sligo Aikido Dojo, MCR Community Hall, Mail Coach Road, Sligo. The exam programs contain what will be asked of students at each of the different levels. 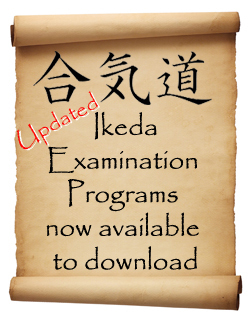 The Ikeda syllabus content is that which is being taught by Aikikai Ireland Technical Adviser Michele Quaranta Sensei 6th Dan, who inherited the methodology as student and Uke to Ikeda Shihan for over 20 years. 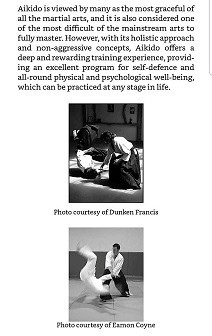 Quaranta Sensei continues to teach and spread this Aikido with great passion and commitment, the proof of which is in the number of international seminars he gives throughout the calendar year in addition to teaching dojo classes in Basel and Prague. You all done a great job, keep up the great work. 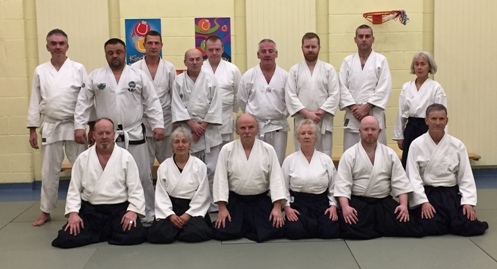 On Saturday 14th and Sunday 15th of October Athboy Aikido Club played host to a seminar with Michele Quaranta 6th Dan Shihan. 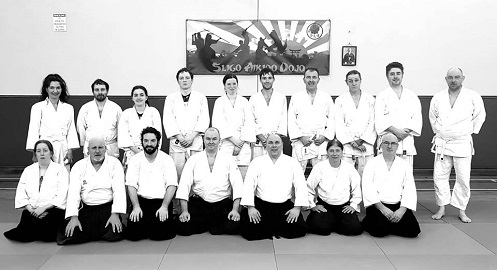 The course was attended from Aikidoka from around the country and abroad and was a great success. Thanks firstly to Michele for great teaching and company, thanks to all of the Athboy crew for the hosting another well ogranised and enjoyable course. Thanks also to Mark in Saddlers well for putting out a nice spread for the crew after hard training. Until the next time, thanks. On Wednesday 15th of November Aikido classes were given by Jean Pasley Sensei and host Joe McHugh Sensei in the Bray Dojo, the classes were thoroughly enjoyed by all in attendance. 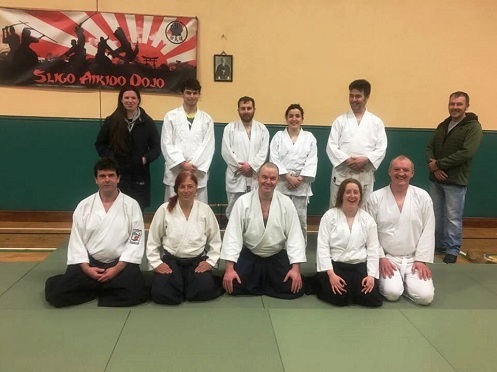 During a work trip to Prague, Sligo Aikido Dojo head instructor Eamon Coyne Sensei managed to squeeze some time to attend the evening class on Thursday 5th of October. 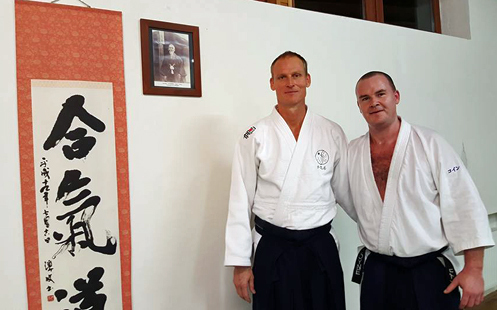 Eamon was warmly welcomed by Miroslav Šmíd Sensei who was teaching class that evening and the students in attendance. 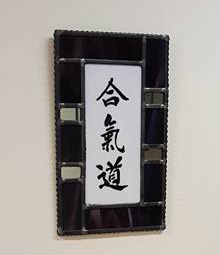 Eamon also noticed whilst on the mats a stained glass Aikido kanji hanging in the dojo which was made specially by a friend of his wife. The stained glass mirror was given to Michele Quaranta as a gift at a course back home in Sligo over 12 years ago. Thanks to Miroslav and all the gang at he Aikido Ikeda Dojo Prague students for a thoroughly enjoyable class in Prague. 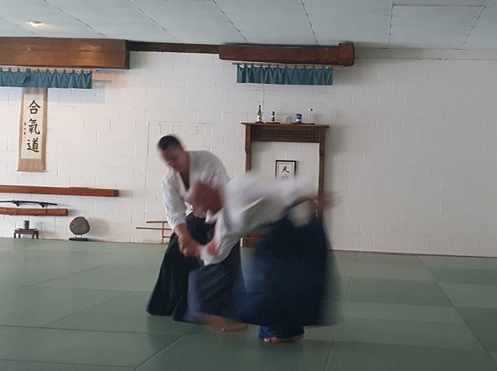 Sligo Aikido Dojo is on a couple of week summer break but on Saturday 12th August 2017 we were delighted to organise a small private class for visitor Neal Dunnigan Sensei, Head Instructor at Wheatbelt Aikido, Oklahoma (http://www.wheatbeltaikido.com/). 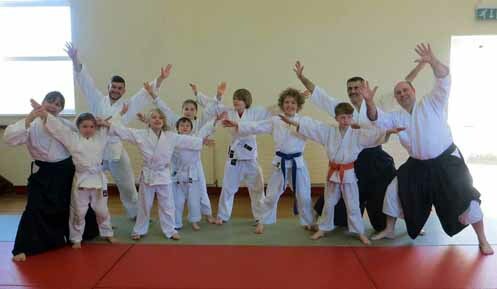 Thanks to Declan Bray IT Sligo Aikido Club for giving us the space to train. Thanks to David Kerins, Cat Dobson and Dermot Gilmartin for the great help on the day. We presented Neal with a new number plate for the car back home and Neal presented myself with one of the Martial Arts books he authored and some jewellery his son had made for the class participants. 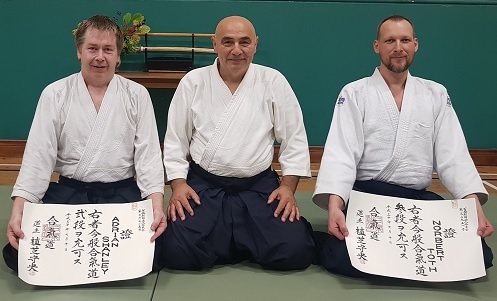 In early July Ikeda Dojo Dublin and it's instructors Norbert Toth and Anthony Brennan hosted visiting Aikidoka from the Swiss Aikido Group Aikido Sursee (www.aikido-sursee.ch) namely Markus Steinmann, Manuela Steinmann, Robin Gubler and Rebecca Marbach. Class was directed by Norbert Toth Sensei and was thoroughly enjoyed by the group. Well done to all and see you guys on the tatami in the future. 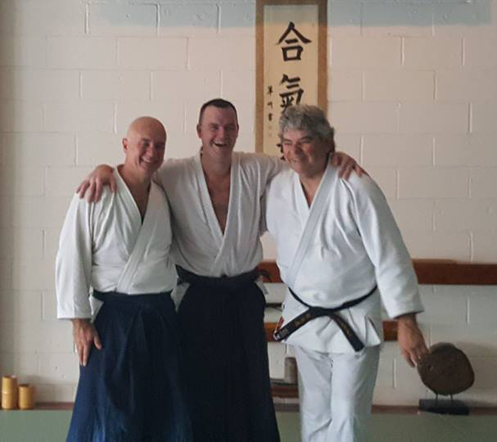 On a recent trip to the United States Sligo Aikido Dojo instructor Eamon Coyne Sensei had the good fortune to visit Greg O'Connor Sensei founder and Chief Instructor of the Aikido Centers dojos (www.aikidocenters.com)at the HQ dojo in East Hanover. 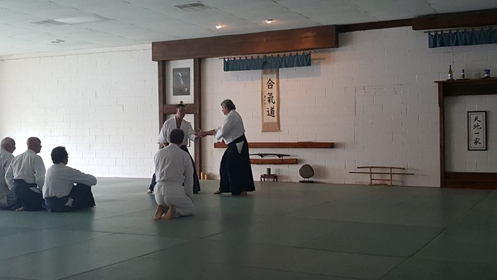 Eamon was met by Ed O'Connor (staff instructor at Aikido Centers) and brought to the beautiful dojo in East Hanover. 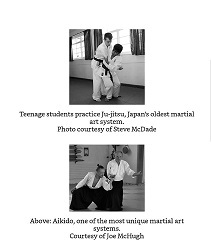 Well done to the kids from both the juniors and teen classes below that passed their tests and progressed to the next stage in their Aikido practice. You done yourselves and dojo proud. Keep up the great work. 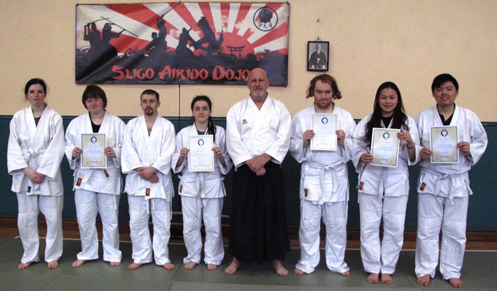 Well done to the kids at Ikeda Dojo Wicklow on the recent promotions, you all done fantasic. Pictured are the children with their teachers Joe McHugh and Lizzy McHugh ;-). 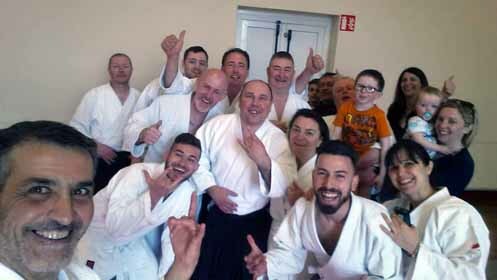 Well done to all on the day, you done yourselves and dojos and Aikikai Ireland proud. Click the link below for course pics. 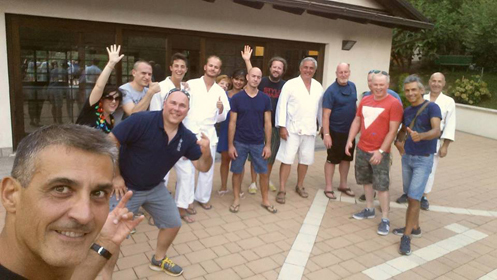 What a fantastic summer camp with Michele Quaranta Shihan in the Bluestack Centre. We had also the privilege of a class with Greg O'Connor Sensei 6th Dan at thc course. We also had Greg's student Ed O'Connor visit us from New Jersey, we had Christophe Flocke Sensei 6th Dan in attendance and his lovely wife Francois from Switzerland. We again had the pleasure of having Valarie McGettigan and Brian Keaney from Boston. 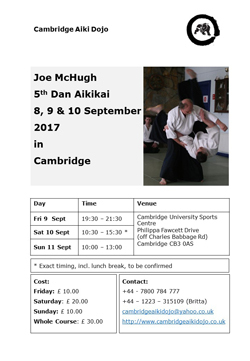 Last but by no means least we had George Hemmings Sensei 5th Dan from Cambridge. 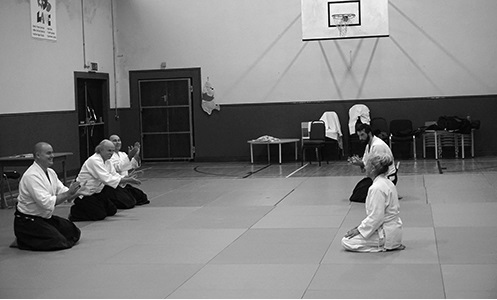 It had a truly international flavour to it in addition to all of the students from Aikikai Ireland. Thanks again for a truly memorable summer camp. Thanks to Carlene Gildea for capturing the moments so well as always in the snaps, follow the link below to see them. On Thursday 15th of June 2017 Joe McHugh Sensei 5th Dan of Ikeda Dojo Wicklow and Jean Pasley Sensei 5th Dan of Rathmines Aikikai gave a class in Jean's dojo in Rathmines. 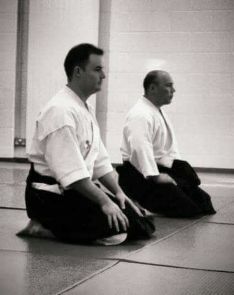 The colloboration between these two Sensei gives the students a chance to see techniques and approach from different angles and deepen their understanding of their practice. A great time was had by all in attendance. 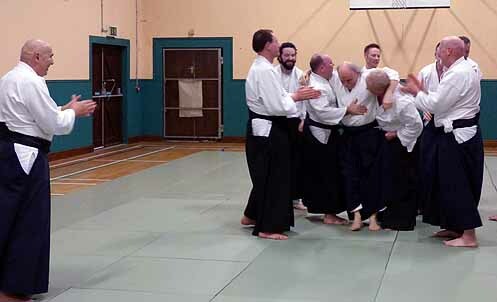 Pictures from the Aikikai Ireland Technical Committee and Kyu exams course held in Athboy on Saturday 22nd of April now uploaded. Click link below for the pics, taken by Pj Kirke on Carlene Gildea's camera. Well done to all. 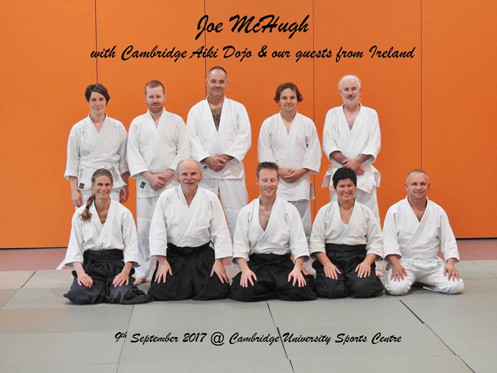 Joe McHugh Sensei of Ikeda Dojo Wicklow has been asked to go and teach a seminar in Cambridge Aiki Dojo by local instructor Britta and Francis (whom recently travelled to Sligo for a course with Michele). The course will run on the 8th, 9th and 10th of September and the details are as follows. 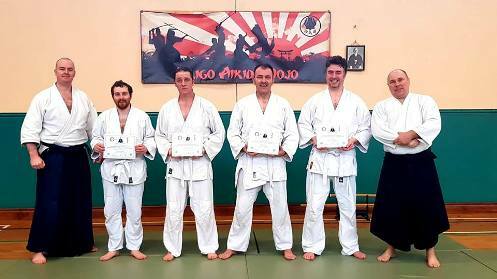 Well done to all of the successful IT Sligo Dojo students that passed their 6th Kyu exams recently in Sligo Aikido Dojo. 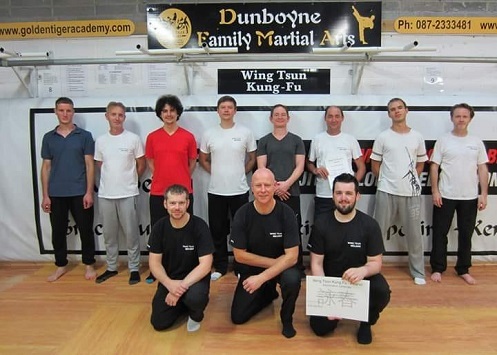 Pictured are the students with their Sensei Declan Bray. Keep up the great work folks. 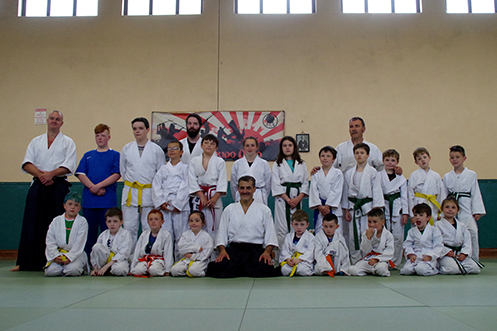 Thanks to Carlene Gildea for the pictures taken at the Michele Quaranta Sensei course in Sligo. Carlene has a great eye for the camera. Location is 111 Scout Den Hall, Springfield, Tallaght, Dublin 24. 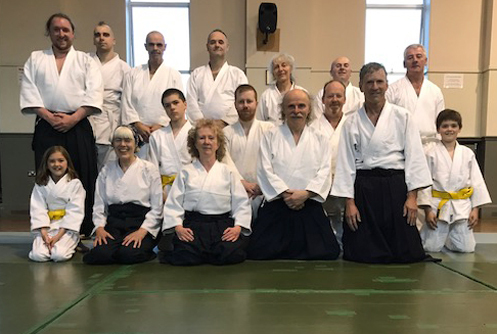 A great days training was enjoyed by all in attendance at the recent course between Joe McHugh Sensei and Ray Burcher Sensei in Henshin Aikido Dojo. €80 normal or €70 student/unwaged. come first served basis. After 29th place people can sleep on tatami with sleeping bag. The Kagamibiraki ceremony 2017 just took place at the Aikikai Hombu Dojo, AIkido World Headquarters, Tokyo.A huge congratulations to Aikikai Ireland's Joe Mchugh Sensei who has been promoted to 5th Dan, well done from all at Aikikai Ireland Joe. Congratulations to all of the other people around the world who were promoted!!! A mention also to our aikido frend in Switzerland Erif Graf whom has also been promoted to 5th Dan. Fantastic Embu by Moriteru Ueshiba Doshu at the 12th International Aikido Federation Congress (2016). 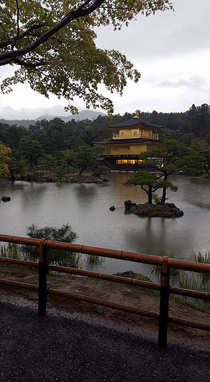 Picture of the famous Kinkaku-ji (Golden Pavillion) Temple, Kyoto taken by Eamon during the trip to Japan. "Your spirit is the true shield."